Size Newborn - 18 month. Inspired by the smocked rompers that were popular in the 1940's, Michaela features a smocked front panel, Peter pan collar, & optional embroidery. Both collar & front panel are bordered by contrasting mini piping. 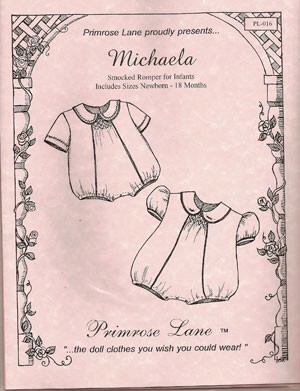 Girl & boy sleeve variations & a simple smocking design is included.